What do you do when you're frustrated? How does your body react? Where does your mind go? When I'm frustrated I turn into someone I'm not sure I like. My blood pressure goes up. Grace goes out the door. No one can do anything right. Everyone is doing something stupid. My mind gets foggy. It's hard to think. And I have a hard time remembering what happens. For example, Monday night I went to the Wal-Mart closest to our house. I needed groceries, a few things for work and B wanted marbles. Some of you are laughing at me right now and thinking "of course that's the setting of your frustration story, stupid girl". But in defense of the Mart, I don't usually have a problem. I go in, get what I need and get out. I could not find what I needed for work. I wasn't certain it existed as I had never used or purchased one before. I wasn't sure I was looking in the right area. So I walked and rewalked the electronics section. I called Zac and made him send me pictures of the sides of my laptop so I could try to find something that might fit. I finally just picked something I thought would work. I received a text that what I picked wouldn't work. I had wasted 20 minutes. Frustrating was growing. I moved on to the office supplies. I could not find a simple plastic folder with brads. What is that about? I find something similar but my frustration inches up. I go to the toy section to grab marbles. I go directly to where I thought no they should be. No marbles. I go up and down every aisle of the toy section. No marbles. My frustration is bubbling and I feel like I'm losing my marbles. When I left the house, I told Ryan and B that this would be a quick trip. I'm now 40 minutes in. I decide to get my groceries. By this time my thought processes are erratic at best. I criss cross the grocery section, retracing my steps as I pass by items on my list and have to go back. More time passes, more frustration. I get everything and decide to make another pass through toys. This time there are 2 families casually strolling through the toy department, getting no my way at every turn. "Really?!? Why would you bring your entire family to Wal-Mart?" I finally face the fact the there are no marbles to be had. Neither in the store nor in my head. At the front, there are no lanes open on the end where I parked. I get in the closest line that looks short. Wrong again. In front of me is a sweet grandma and her grandson. It appears they haven't been to the store in a year. I get a text about a problem at work. I test out the problem. Yep, it's there and it appears to be a big issue. I escalate the problem to the appropriate person. Seething, I check my heart rate. A full 30 beats per minute higher than usual. I finally get out of the store but not before I buy a Psalm coloring book and a Milky Way brownie. Always an emotional eater, I scarf down the brownie in the car, take some deep breathes and drive home. I get home and recant my stories to Ryan. He has mowed and edged the yard and is on finishing dinner. That's how life no this short trip had taken! Of course I get riled up all over again as I retell my stories. Later that night, as I lay in bed, I wonder "How did I let myself get so frustrated?" I hate to admit it but this happens to me a lot. Little things pile on top of each other and I push myself to the edge. When I've had a really bad day, it's most likely that a lot of small things have added up versus one thing happening. I know if I'll pause, breath and pray, I become less frustrated. But sometimes that's hard to do. It's like a wave of frustration comes and carries me out to the sea of frustration. Honestly, I can't wrap this up in a pretty little bow: I got really frustrated this one night, God taught me how to not get caught up in that cycle and now everything is fine and dandy. It's not fine and dandy yet. But it will be. God is teaching me. He will continue to lead me as long as I submit to being led. Perhaps He uses these frustrations to draw me closer to him. 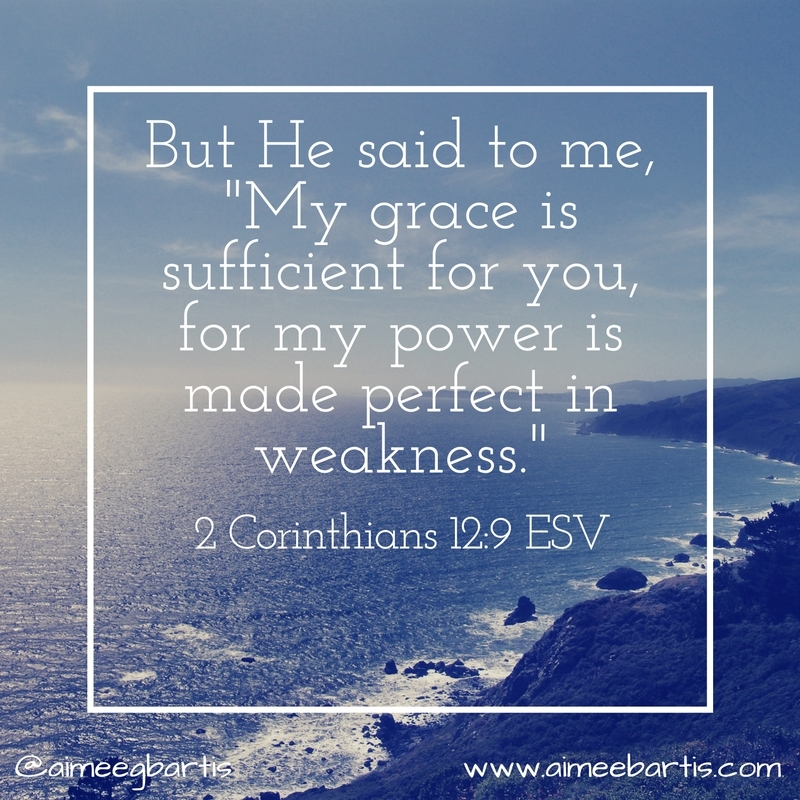 I know he uses our weaknesses for His good. 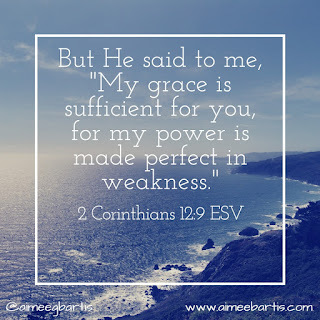 This morning I read about the thorn in Paul's side in 2nd Corinthians 12. His grace is sufficient for me. Even when I'm frustrated. Especially when I'm out of control frustrated.